Hello friends and welcome! I'm excited to share with you today that I'm guesting over on the Sunny Studio Stamp Blog with a cute Polar Bear Christmas Shaker Card. I hope you'll stop by and check it out. 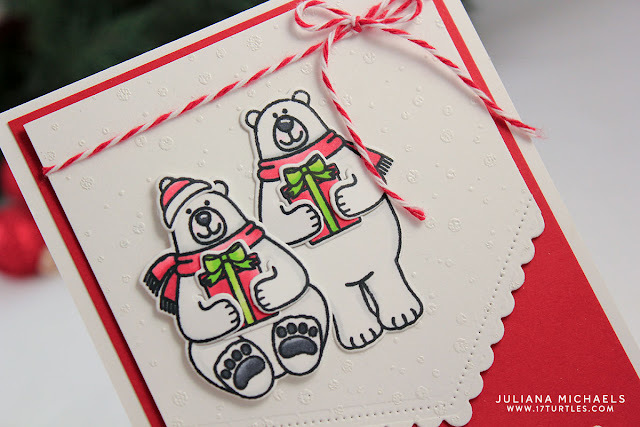 While I had my Sunny Studio stamps out and was creating, I also made another Polar Bear Christmas card using the new Playful Polar Bears and Frosty Flurries Stamp Set that I wanted to share with you. I began by stamping the adorable polar bears, the present and the hat and colored them with my Chameleon Pens. I then die cut them using the coordinating Playful Polar Bear Die Set. Because of how the dies are made, the polar bears look like they are holding the presents! To create the white panel behind the bears, I trimmed a piece of white cardstock to 4 x 5.25 inches. I then used the scallop and the dotted dies from the Fish Tail II Die Set to cut the panel at an angle and give it a bit of a fun edge. 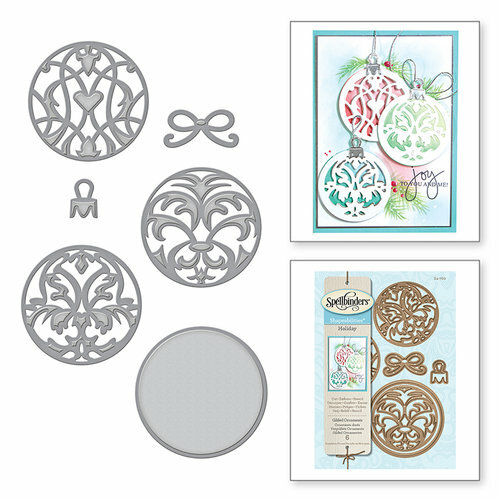 I then took the Frosted Flurries Stamp and repeatedly stamped it with Versamark Embossing Ink over the entire piece. I then heat embossed it with white embossing powder. This gives the background a subtle bit of texture and interest. The final touch for my card was a bit of red and white baker's twine...kind of reminds me of peppermints! Does it for you too?! 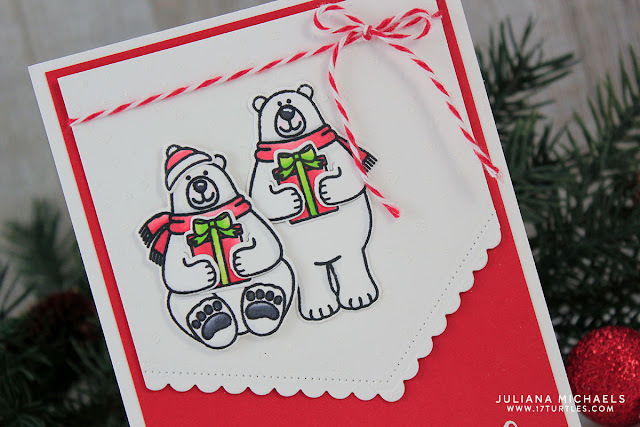 Thanks so much for stopping by today and don't forget to head over and check out my Polar Bear Christmas Shaker Card on the Sunny Studio blog. 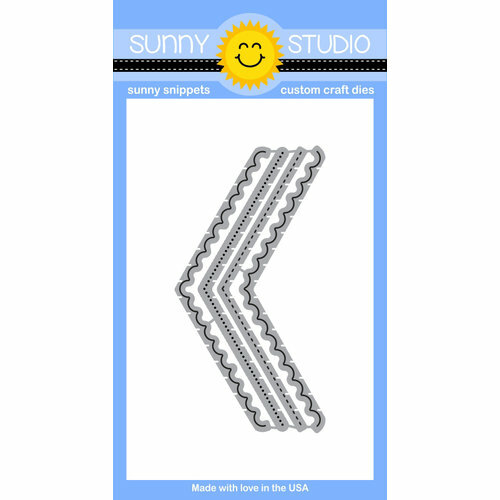 Are you interested in the Sunny Studio Stamps supplies I used to create these cards? To make them easy for you to find, I have listed them below. 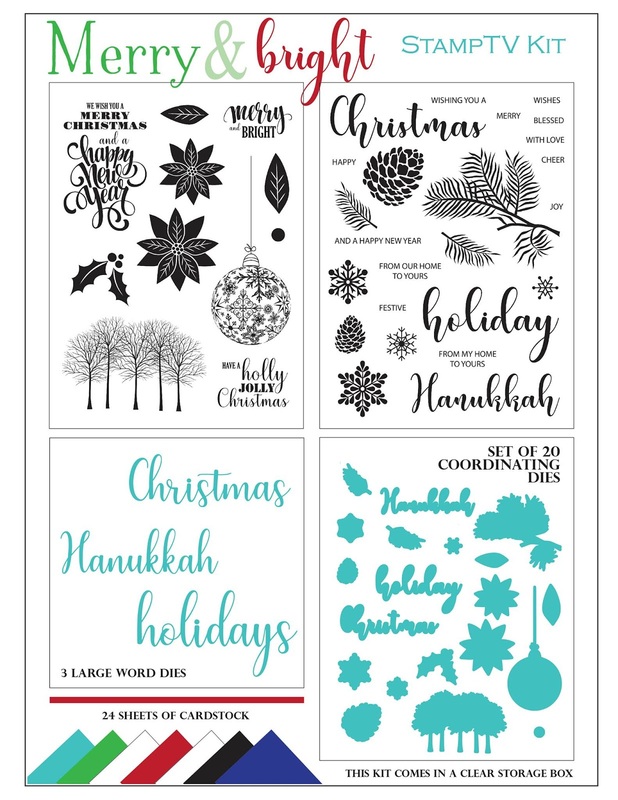 Affiliate links to Scrapbook.com are used at no additional cost to you and I've linked to them because I use them and love them! There are only 60 days until Christmas! Are you ready? I've already begun my Christmas card crafting and today I'm sharing a Christmas Ornaments Card I created using some fabulous supplies from Spellbinders and Scrapbook.com. Christmas ornaments have always held a special place in my heart. Since I was a born, I've collected a new ornament every year to add to the Christmas tree. And yes, I have quite the collection now! With this in mind, I was immediately drawn to the gorgeous Gilded Ornaments Die by Spellbinders. To create this card, I began by die cutting several circles from white cardstock using the circle die included in this set. I knew I wanted to do something different with the dies, so I decided to try embossing. Following the instructions on the machine I layered the various plates to emboss with dies. 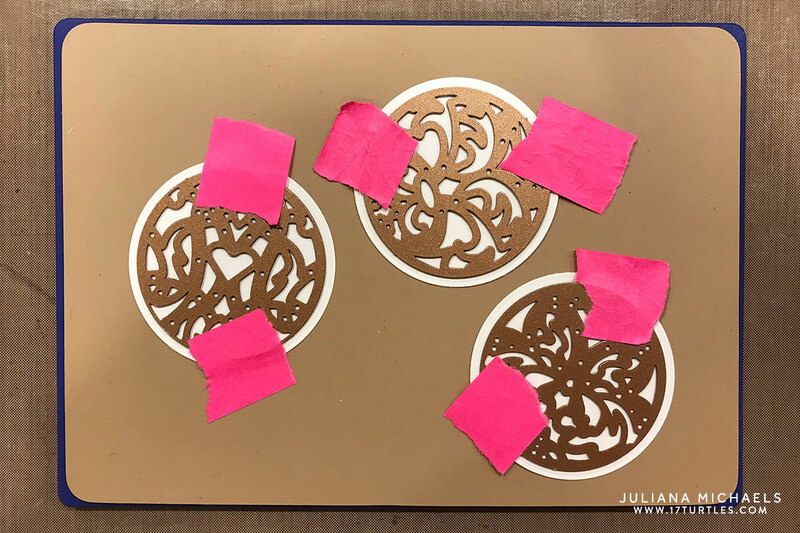 To ensure proper alignment, I placed the dies in the center of the white die cut circles and used temporary adhesive to hold them in place. 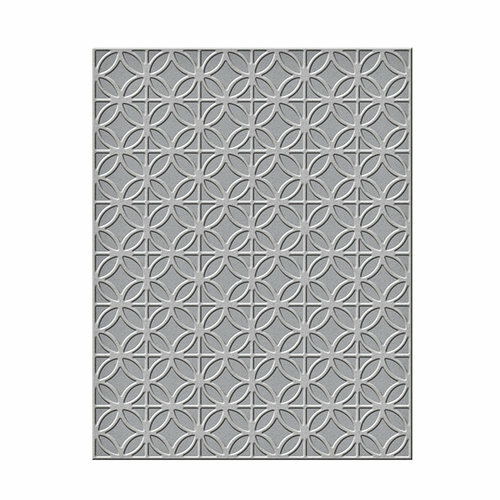 I then ran everything through the Platinum 6 and out popped these gorgeous embossed circles. Next, I added some ink to the ornaments to give them a bit of color and to bring out the embossed details. 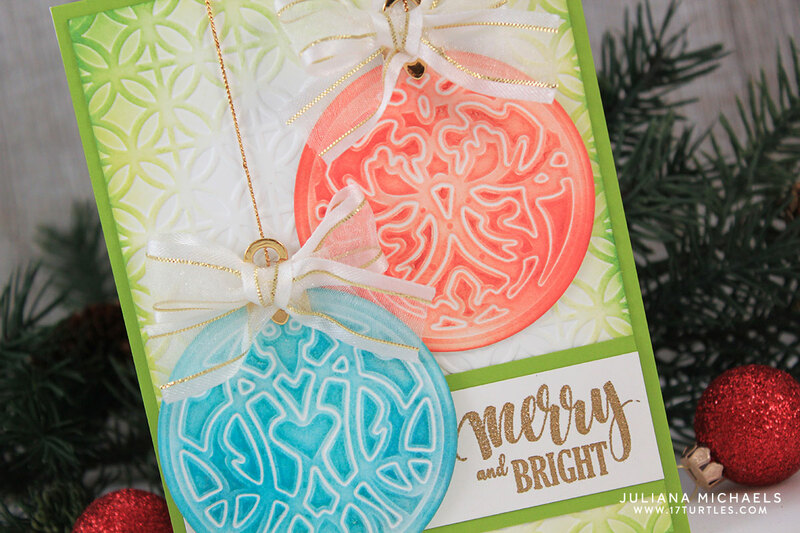 You could also do this embossing technique with colored cardstock for a bolder design. 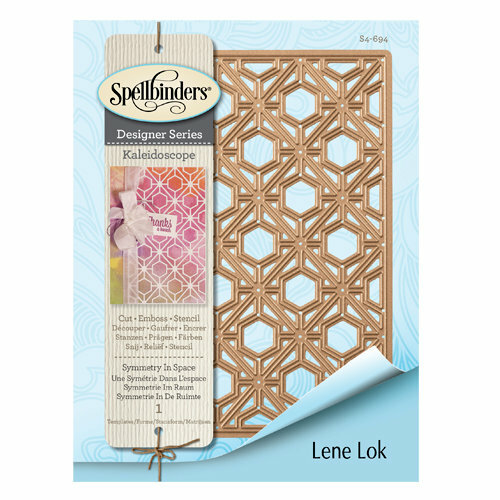 The background on this card was created using the Spellbinders Circles and Diamonds Embossing Folder. I also inked the edges of this to again bring out some of the embossed details. Before adding the ornaments to the card front, I added the ornament hanger which I die cut from gold foiled cardstock. The final touch was some gold cord for "hanging" them and a fun little bow. 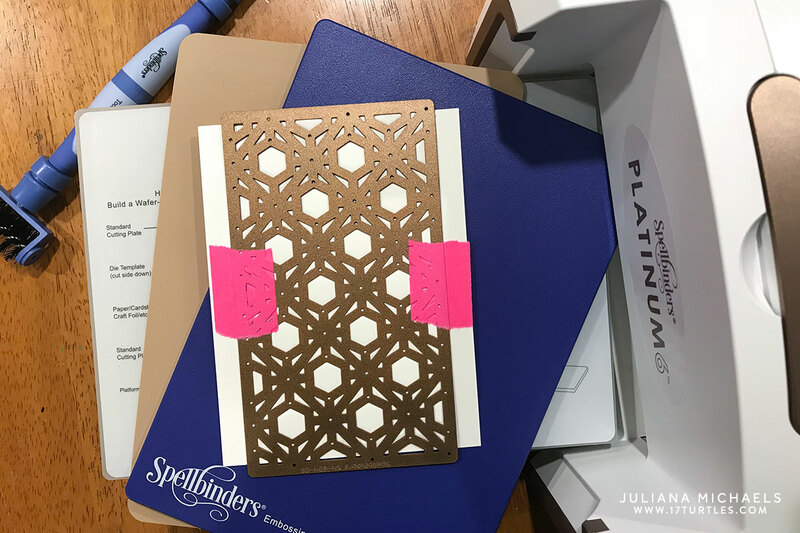 Embossing with dies has now become one of my favorite new techniques thanks to the amazing Spellbinders Platinum 6 Embossing and Die Cutting machine. 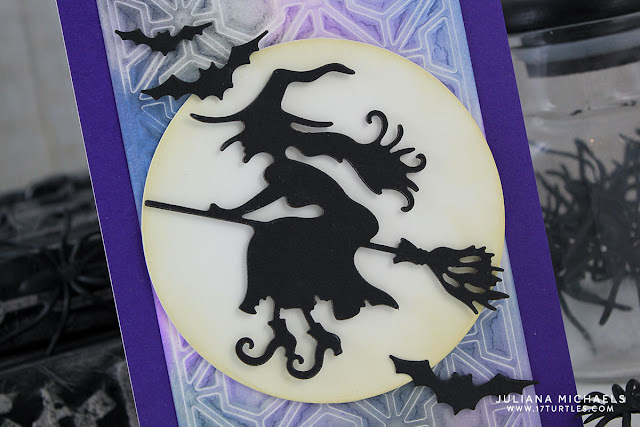 Spellbinders and Scrapbook.com were kind enough to send me a Platinum 6, Tool N One and a couple of dies to create with and I recently shared a Halloween Witch Card I created using the Witch On A Broom Die. 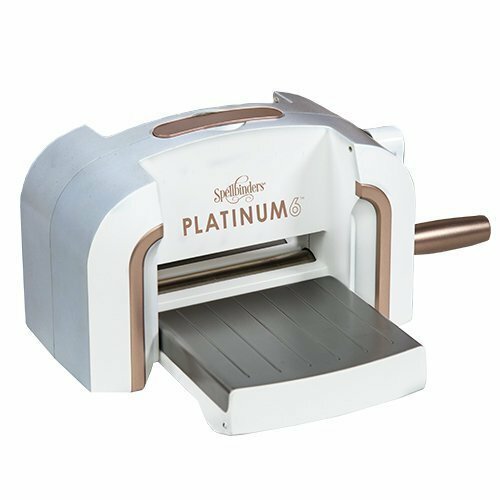 I want to thank Spellbinders and Scrapbook.com for this fun opportunity and for introducing me to my new favorite manual die cutting machine! The supplies I used to create this project can be found at Scrapbook.com. Affiliate links have been used at no additional cost to you. 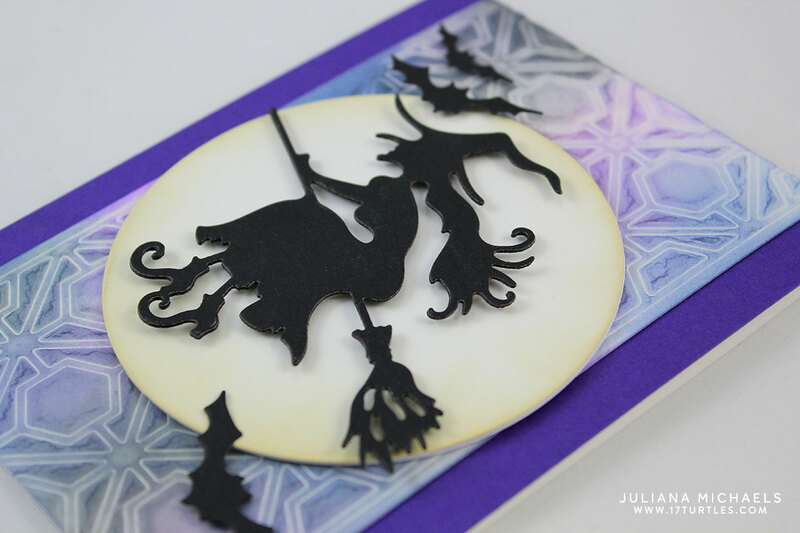 Halloween is right around the corner and I'll be sending out my Halloween cards this week to make sure they arrive in time to celebrate one of my favorite holidays! Today, I'm thrilled to share a Halloween Witch Card I created using some fabulous supplies from Spellbinders and Scrapbook.com. 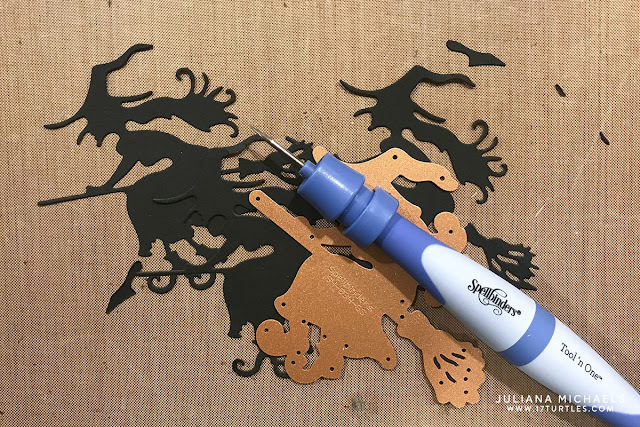 I'm a sucker for all things Halloween and this Witch On A Broom Die from Spellbinders is eekingly perfect for creating a Halloween card. 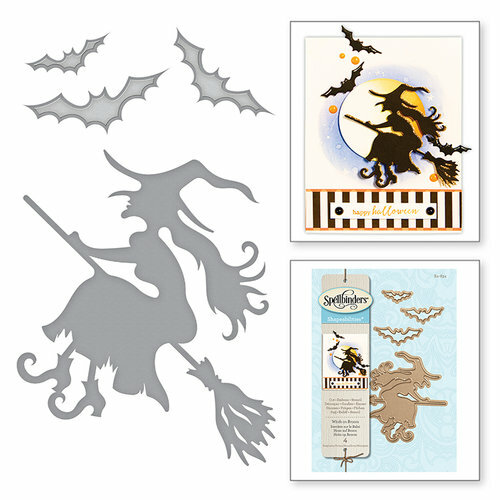 I began by die cutting the witch and bats from black cardstock. 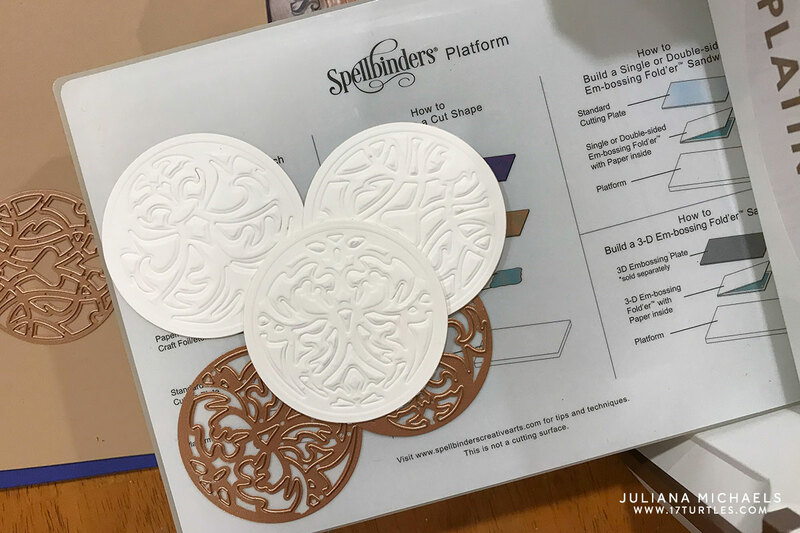 There are a few small pieces to pop out from this die and the Spellbinders Tool N One was perfect for poking out some of those small pieces. As you can see I cut several of the witch. I glued and layered all of these on top of each other to give this detailed design a little more sturdiness. To create the background, I used the Spellbinders Symmetry in Space Die and one of my new to me favorite techniques...embossing with a die! 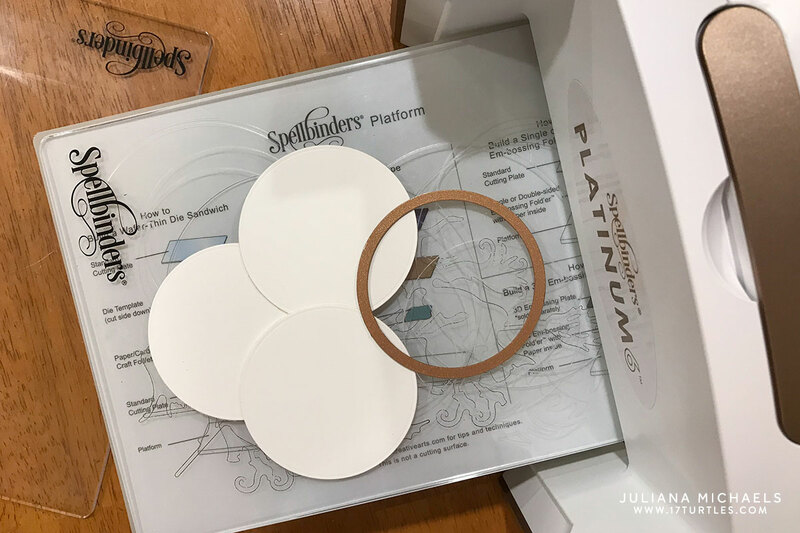 I love how easy it is to do this with the various plates included with the Spellbinders Platinum 6 Die Cutting and Embossing Machine. After I trimmed the embossed panel to size, I blended several colors of ink to give it the look of a night sky look. The witch and bats, of course needed a full moon behind them so I die cut a circle from white cardstock and inked it just around the edges for a touch of color. I then added all of the die cut elements and popped up the witch and bats with some double sided foam adhesive to give them a bit of dimension. 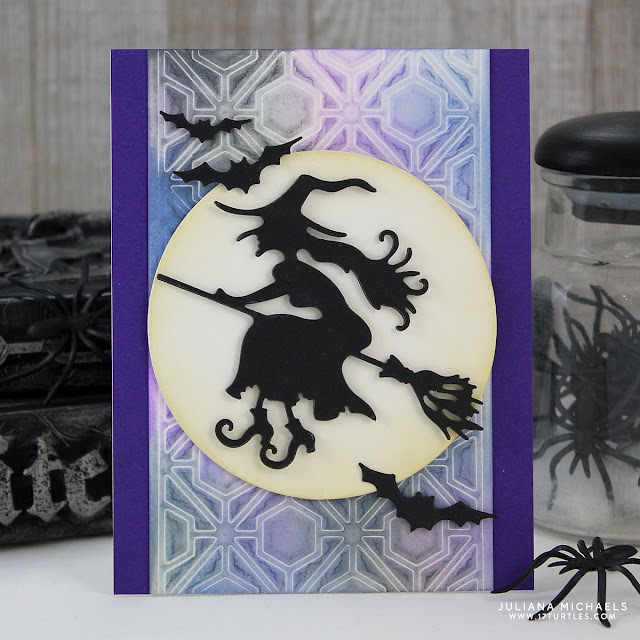 I hope this Halloween Witch Card created using these fabulous products from Spellbinders inspires you to get your Halloween craft on! 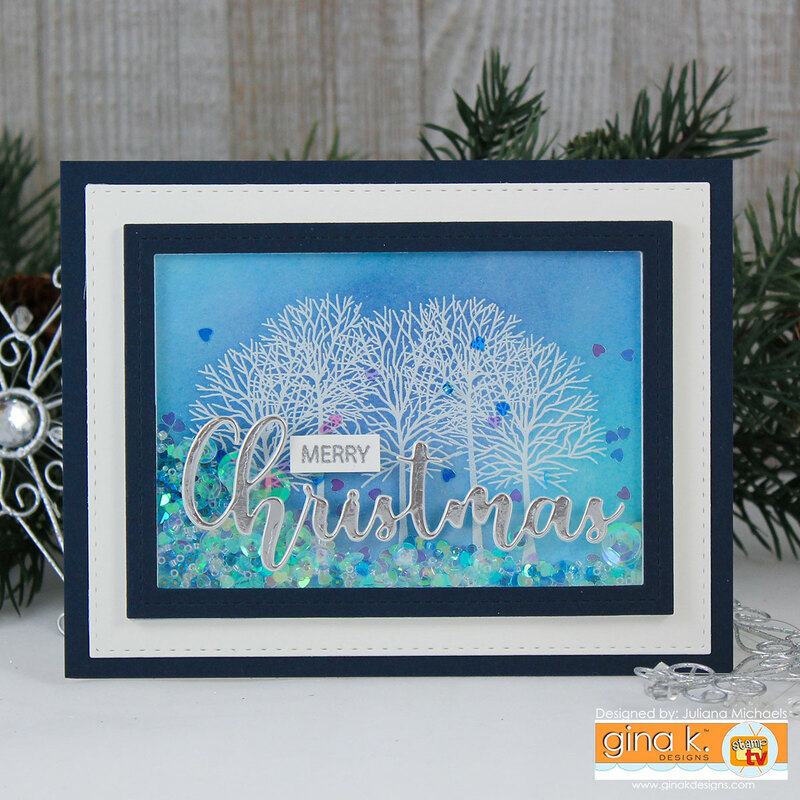 Hello friends and welcome to the Gina K Designs Merry & Bright Stamp TV Kit Blog Hop! 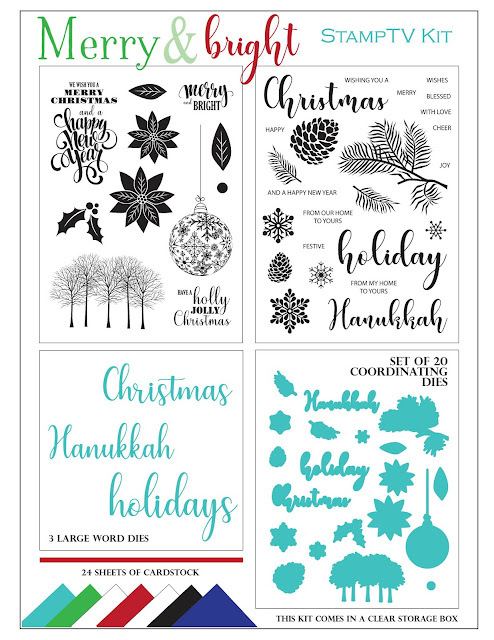 Today the design team is sharing cards created using this new kit. So sit back and enjoy the inspiration as you hop along. You can also enter to win a $50 gift certificate to the shop. All the details are listed below. 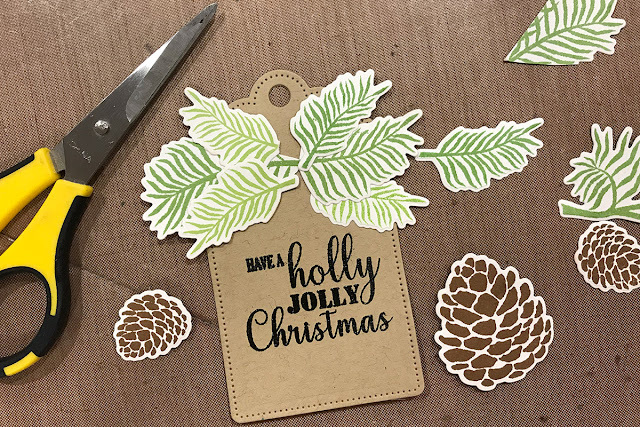 For my first card, I began by stamping the pine boughs in Jelly Bean Green and Green Grass and the pine cones in Dark Chocolate onto white cardstock. I then die cut them using the coordinating dies. 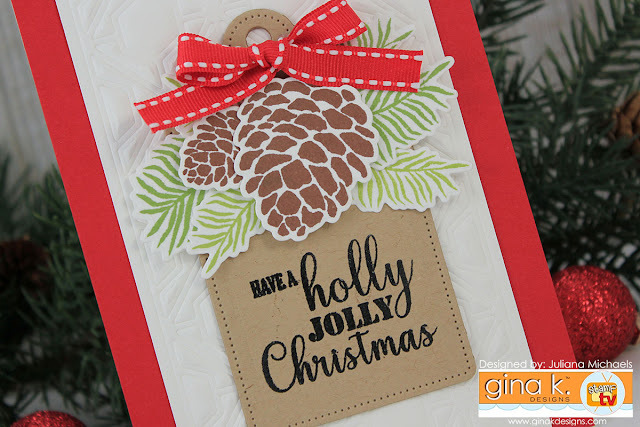 Next, I die cut the tag from kraft cardstock using the Gina K Designs Nested Tag Dies and stamped the sentiment on it using my MISTI to line it up just right. As I was arranging the pine boughs on the top of the tag, I did a little trimming to create my own custom arrangement. Don't be afraid to do this with stamping, especially if you are going to be layering things on top that you can hide it behind. Here is how they look before I added the pine cones. 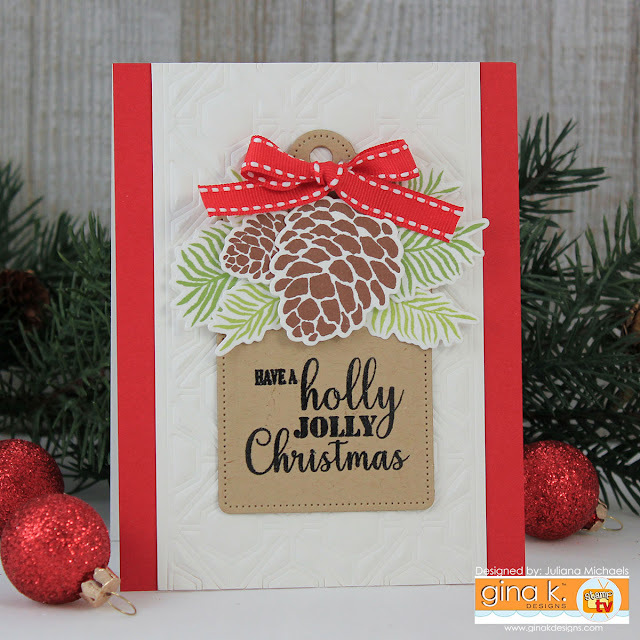 Before adding the tag to the card front, I adhered the pine cones using some double sided foam tape and attached a little red bow using Therm O Web Zot. My next card is a shaker card. 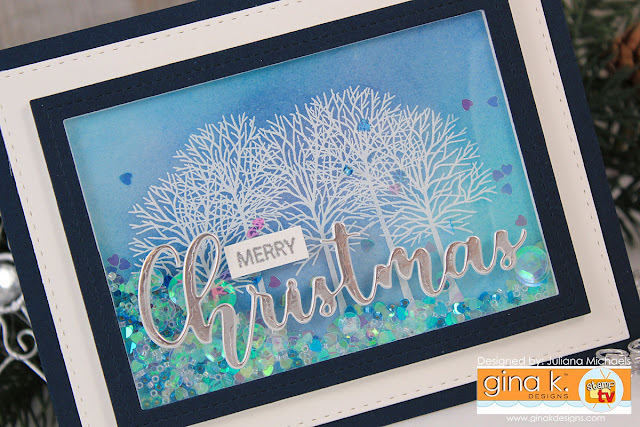 I began by stamping the trees onto white cardstock and heat embossed them with white embossing powder. I then ink blended Distress Oxide Ink in Salty Ocean, Faded Jeans and Peacock Feathers. Using the Christmas die included in this kit, I die cut the word Christmas several times from white cardstock and glued them together. I then die cut it from silver foil cardstock and adhered that to the top and then attached the word to the front of the shaker. 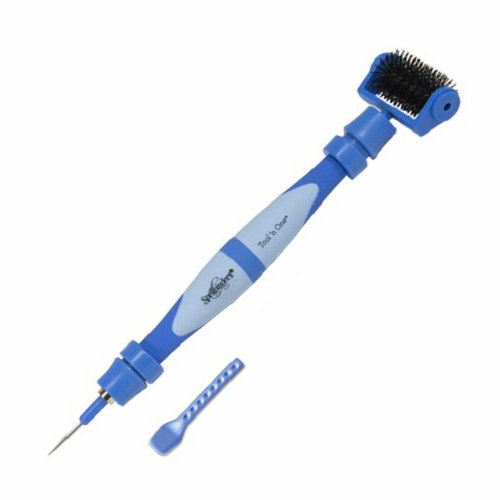 The word "merry" was stamped and heat embossed with silver embossing powder. Would you like to win a $50 gift certificate to Gina K Designs? If your answer is yes, then all you have to do is visit each blog along the hop (listed below) and leave a comment. 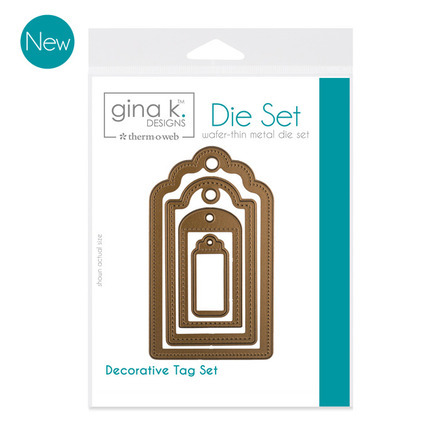 One lucky winner will receive a $50 Gina K Designs gift certificate! To see who won, check the Big News Forum at StampTV a few days after the hop.